The shift towards a cashless society is transpiring all across the world, as countries join in and ditch cash for simpler, more efficient methods of payment. In 2011, 66% ($42 trillion) of total global consumer spending was done with cashless payments, and that number is quickly rising. This change has been made possible by recent advancements in technology. The movement towards a cash-free society has many pushers, including individual businesses who offer cashless payment methods and consumers who are eager to ditch cash. The movement has even been picked up by national governments who are recognizing the benefits of going cash-free and implementing reforms and initiatives nation-wide. 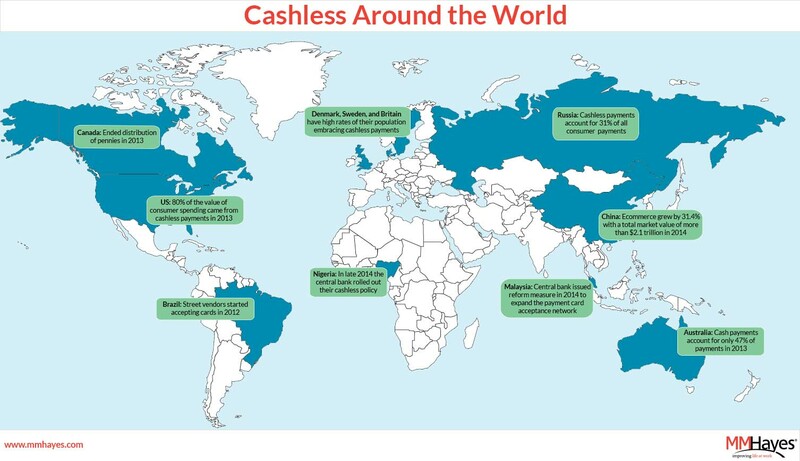 Here are how some of the leading countries in the cashless movement are changing society. Denmark: Denmark is poised to become the world’s first cashless society. The government recently proposed eliminating the obligation for retailers to accept cash as payment. The government hopes to get rid of the option to pay by cash by as early as 2016. There is already a precedent for going cashless in Danish society, as almost a third of the population uses an official Danske Bank app called MobilePay, which allows users to confirm payments with their smartphones. Canada: A recent survey in Canada found that Canadians are now using cash for fewer than half of their transactions. Contactless credit cards, in particular, are seeing strong growth in use. 90% of the total value of consumer payments in Canada are cashless as of 2013. The central bank has also supported the move to a cashless society by ending the distribution of pennies in February 2013. United States: E-commerce hit $1 trillion for the first time in 2012. 80% of the value of consumer spending came from cashless payments in 2013, and 72% of the population has a debit card. Cashless payments are occurring all across the nation in toll roads, festivals, and businesses. Britain: A recent survey conducted found that 1 in 4 Brits will walk away if businesses don’t accept card payments. 71% of Brits admit to carrying less than £20 in cash at any one time. 18-24 year olds carry an average of only £12.81 at any one time. In addition, buses in London went completely cashless in July 2014. Sweden: Sweden has the most card payments in the European Union, with 230 transactions per person in 2012. The Swedish central bank predicts the amount of cash in Sweden will fall by between 20 and 50 percent by 2020 compared with 2012. China: E-commerce in China grew by 31.4% last year, reaching a total market value of more than US$2.1 trillion in 2014. Its rate of growth in cashless consumer payments is one of the fastest in the world. You can participate in the cashless movement as well by using less cash in your everyday life when making purchases. You can also create a cash-free work environment at your company by using Quickcharge. Quickcharge allows employees to use their preexisting ID badges to make purchases, making transactions faster, easier, and more convenient for everyone. With no interest or fees, Quickcharge is the perfect way to incorporate cashless payments in your workforce. Contact us today to learn more about how to improve your business!